Go BIG or go home? Go BIG. Until a few years ago, I was a “wayward” mathematician. I thought all I could do was teach and I wanted out. While teaching is noble and one of the highest callings, I wanted to do something other than my tenure-track position. Now don’t get me wrong, I knew mathematicians did more than teach. But personally, I had not done a lot of applied mathematical work. Nothing wrong with it, I just hadn’t. (My area of research was a branch of Combinatorics called Matroid Theory.) However, when I started looking I found all kinds of employment opportunities. When I finished my PhD, there didn’t seem to be a shortage of academic jobs. You might not get a position at Research I institution, but you could find a tenure-track position at a pretty decent institution and be happy. I still see colleges and universities hiring for these positions, but when comparing the number of open positions to the number of Ph.D. graduates annually…there are not enough academic jobs. So what to do? I recommend considering jobs outside academia. All too often in the MATH community, because of its traditions, a common sentiment is one that unless you are tenure-track faculty, you’re not a good mathematician. It took time…but I got over that nonsense. I wanted to do something different with my mathematics. I went BIG. Personally, I have always been civic-minded. I’ve always been active in my community – volunteering and helping those in need. Academia allows you this fulfillment to a certain extent. So I ask you this…how important is it that we use mathematics in everyday places in our communities and across society with the critical thinking skills and expert problem solving skills? Or use mathematics and technical abilities to help solve the world’s problems to help ease society’s woes? Or use mathematics to bring forth innovation and technology? To transition from academia to government, I broadened my experience beyond the classroom by participating in faculty research opportunities with the federal government. While working with NASA, I studied the relationship between random graphs and Bayesian networks to improve methods for determining and maintaining systems health in autonomous avionics. While working with the U.S. Navy, I worked with a team to examine statistical measures of uncertainty to create techniques for use with data integrity problems. I also took graduate courses in public policy analysis at a local university. Depending on your interests, you may need to do some additional training to expand your own skill set. Further building on my new skills, I applied for and was awarded the AMS Congressional Fellowship. I worked on Capitol Hill as a staffer bringing a scientific perspective to the halls of Congress. Thankfully, on my path to a non-traditional mathematics career, I encountered people, including fellow mathematicians, who encouraged me to pursue my passion and explore careers where I might use both my analytic skills and my soft skills. It hasn’t been the easiest thing. I have had to navigate uncharted waters and remarket myself for this new world. I have increased my personal and professional network to include the mathematics community, the broader scientific community and the non-scientific community- the community we are all a part of. This encompasses a world bigger than the classroom, office or campus. After all of this, the next question might be…what can I do if I’m interested in positions outside of Academia – Business, Industry, Government (BIG)? The BIG Math Network is a great place to learn about opportunities and to network with like-minded individuals, who are also interested mathematical careers in business, government and industry. Explore this BIG website. A good Google search never hurts either. Finally, I recommend that you Network. Talk to those for doing types of work the interest you. Whether you contact a researcher at a Federal lab or congressional fellow/staffer, most people will be glad to talk to you about their experiences and provide information for similar lines of work. I’m always glad to share my BIG experiences and knowledge with anyone who is interested. Carla Cotwright-Williams is an IT Fellow/Computer Scientist for the Social Security Administration. Email her at carla.cotwright@gmail.com. 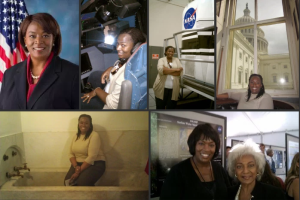 Dr. Cotwright-Williams is featured on the new blog Mathematically Gifted and Black.